I'm not a big fan of dolls, but when I heard there was an exhibit here this month entitled "What A Doll", I knew what I would paint for the show... A few years back, I was helping my mom clean out the attic and up there we found remnants of my sister's doll collection. Along with all the other what-not, there was this clown doll. 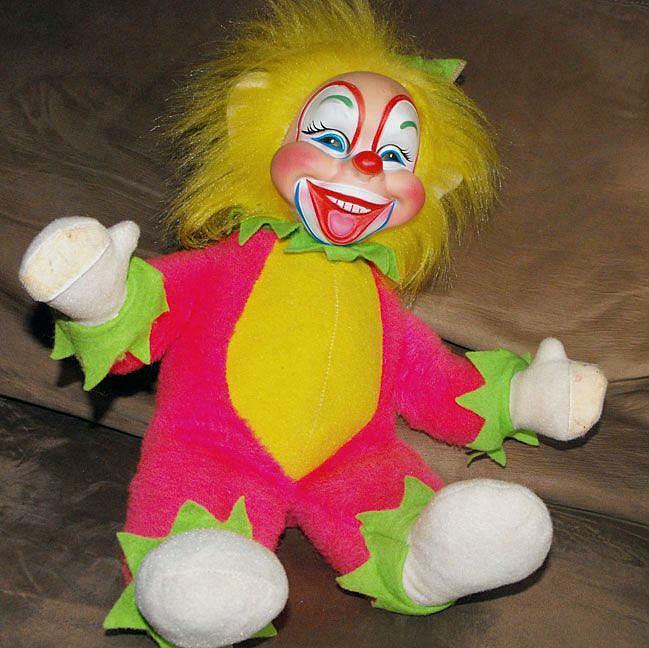 Again, I don't really like dolls, and I'm not into clowns, either, but both my husband and I thought this clown doll was just too hideous to throw away. So we kept him. We brought him home and put him on a shelf in the basement. 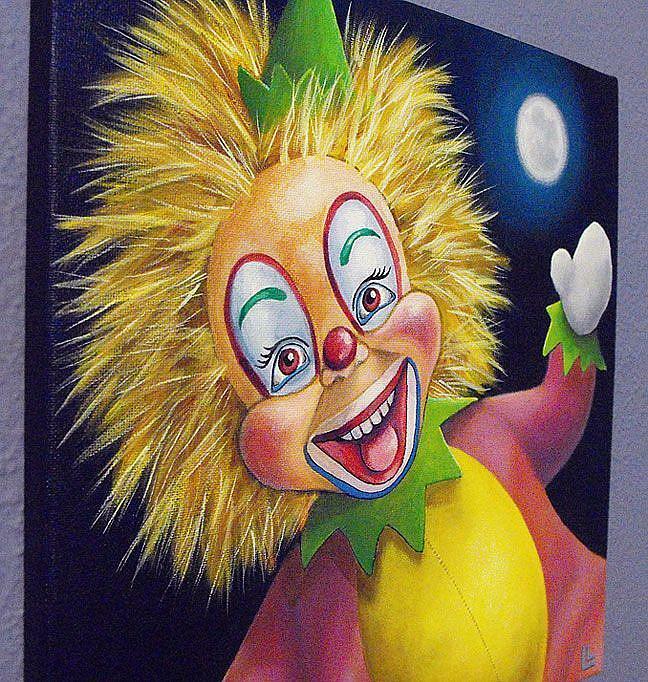 We rent a couple of rooms in our finished basement, and at one point we even had a tenant ask us to move the clown doll because it creeped him out. The really weird thing is I've asked both my mom and my sister if they have any memory of how he came to us. Was he a gift? Who did he belong to? I don't remember him being around during my childhood, and neither does my sister. My mom doesn't have a clue, either. It seems like he just appeared in our lives and moved into the attic on his own. Ha haa. He is indeed creepy, so I painted him under the light of the full moon... 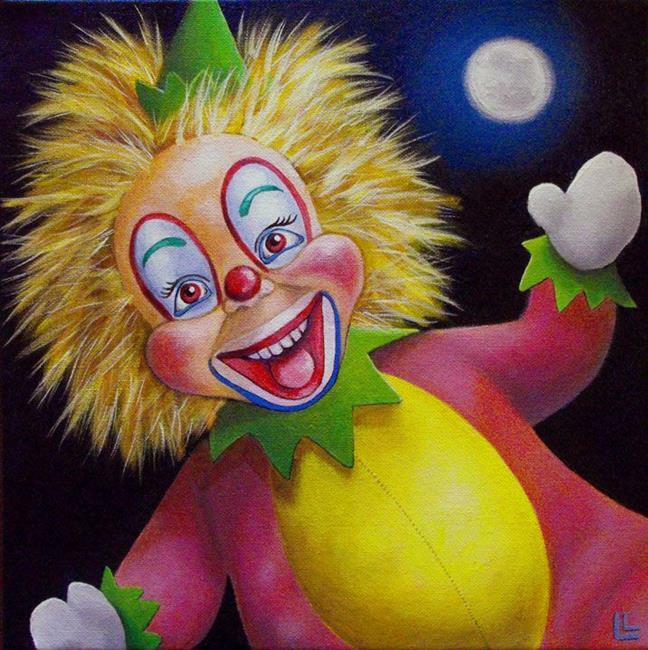 He only comes out at night, and he runs down the streets, laughing hysterically. When will he come running down YOUR street??? Bwwaaa haaa ha ha haaaa!!! My model, the creepy clown doll from the attic.